You are cordially invited to two unique events . 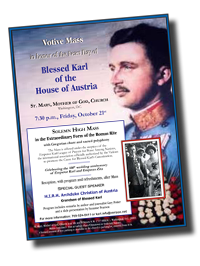 . .
to promote the Cause for Blessed Karl’s Canonization. Metro (red line): Exit at Gallery Place/Chinatown or Judiciary Square. 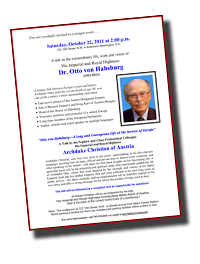 A limited amount of free parking is available in the church’s parking lot, entered from H St.
Saturday, October 22, 2011 at 2:00 p.m.
722 12th Street, N.W. in downtown Washington, D.C.
Archduke Christian, who was very close to his uncle—participating in his first election campaign, assisting him on many official and private trips to almost every continent, and often speaking on his behalf—will share his first-hand insights on his fascinating life. A particular focus will be the principles and spiritual values that consistently guided the life of Archduke Otto, values that were inspired by the example and virtues of his father Emperor Karl and his mother Empress Zita and were reflected in his own long years of public service. His ideas, example, and accomplishments left an indelible imprint on his own times and offer a strong message for the future that people of today need to hear. The talk will be followed by a reception and an opportunity for questions Archduke Christian will be accompanied by his wife, Her Imperial and Royal Highness Archduchess Marie-Astrid of Austria. Note: The Auditorium at 722 12th Street, N.W., is directly across from Metro Center Station. Street parking is limited but there are multiple paid parking facilities within a block or two.